Having claimed the world title in 2013, ski jumper Kamil Stoch will travel to Sochi as one of the favourites for his events, and will be hoping to emulate the past Olympic successes of fellow Poles Wojciech Fortuna and Adam Malysz. 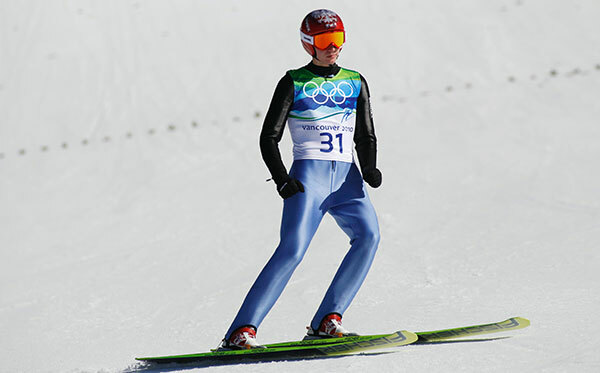 "The Olympic Winter Games are huge, it's fantastic,” enthuses Kamil Stoch. “This is the event that I wait to compete in every four years, it’s the reason that I work so hard.” Sochi 2014 will be the Polish ski-jumper’s third Games, following his appearances at Turin in 2006 and then Vancouver in 2010. In both cases his best results came in the team events, where he finished fifth and sixth re-spectively. On 28 February 2013 Kamil Stoch became world champion on the large hill of Val Di Fiemme fol-lowing jumps of 131.5m and 130m. He took that triumph in his stride: “My life does not change,” he reflected. “I have finally achieved my goal, it was a dream of mine and it is nice to realise that dream." Stoch has now set himself a new goal: namely to help the Polish team achieve glory on the big and small hills at Russki Gorki, the venue for the ski-jumping events at Sochi 2014. Born in the heart of Tatra Mountains, in the town of Zakopane - a hotbed of Polish ski-jumping - Stoch’s rise to international prominence was remarkable. He made his World Cup debut in his home town as a 16-year old in January 2004, and it was there too that he enjoyed a first career win almost exactly seven years later in January 2011. Since then, he has been an ever present on the podium in front of his home crowd, taking first place in 2012 and then third in 2013. Having matured over the last three seasons, Stoch is now a major player on the world circuit, hav-ing amassed 20 podiums and nine wins in the FIS World Cup. His latest Olympic season got off to a fantastic start, with back-to-back victories in December at Titisee-Neustadt (GER) and Engelberg (SUI), where he shared the podium with fellow countryman Jan Ziobro, who finished third. He himself went on to claim third place during the third stage of the Four Hills Tournament in Innsbruck (AUT), finishing the prestigious competition in seventh overall. The Polish record-holder for the longest jump, (232.5m on the HS225 hill at Vikersund, Norway on 26 January, 2013), Stoch is hoping to follow in the footsteps of Wojciech Fortuna, who took Poland’s first and only ski-jumping gold at Sapporo 1972, and those of Adam Malysz, a four-time Olympic medalist at Salt Lake City 2002 and Vancouver 2010. Together with downhill skier Justyna Kowalczyk, he represents Poland’s best hopes of a medal at Sochi, and admits he cannot wait for the competition to begin. "What makes the Games more special is that they only take place every four years. All the athletes from all over the world are gathered in one place to compete. That’s why the Olympic Winter Games are so important!"